Did you know that March is National Frozen Food Month?! Kidfresh has set out to spread the word about their frozen kid's meals, these meals are fresh, quick & nutritious, making them the perfect meal option for busy days! As a single parent of two children, our schedules are packed, our days are long & that doesn't always leave time for a home cooked meal! My children know if they want a healthy & easy meal, they can reach for Kidfresh in our freezer anytime! Kidfresh locks in all the best nutrients & ingredients at the perfect moment to make sure their meals are frozen in the best possible way until your children are ready to enjoy them. Kidfresh meals are all natural, they are full of hidden veggies inside (because lets face it, getting your kids to eat veggies is always a struggle), & their packing is BPA free! Your children will fall in love with Kidfresh meals, they currently offer: Super Duper Chicken Nuggets, Mamma Mia Cheesy Pizza, Mighty Meaty Chicken Meatballs, Fun-tastic Fish Sticks, Wagon Wheels Mac+Cheese, Totally Twisted Pasta+Meatballs, Rainbow Rice+Chicken, Spaghetti Loops+Meat Sauce, Muy Cheesy Quesadillas, Easy Cheesy Ravioli & Muy Bueno Kids Burritos. While shopping at our local Krogers, I was able to pick up a variety of Kidfresh meals for my children to try! This isn't our first time purchasing Kidfresh, so my children are pretty familiar with the meals they have to offer! 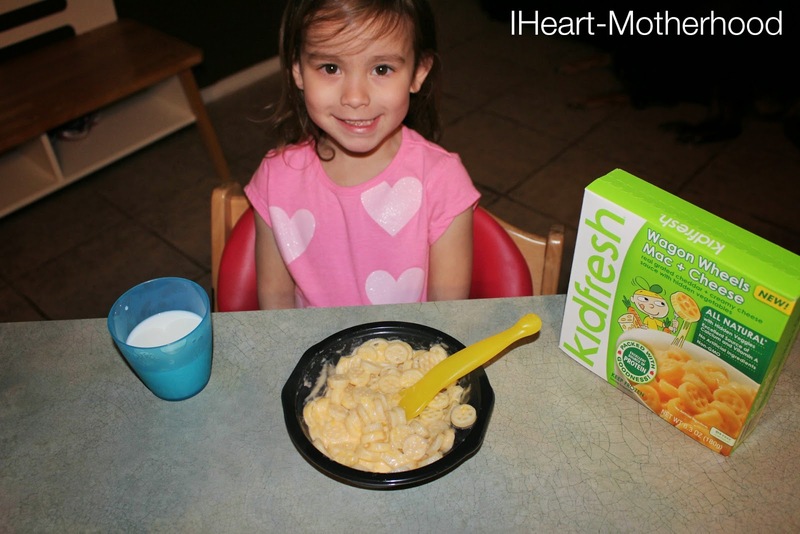 Hands down, my children's favorite Kidfresh meal is Wagon Wheels Mac+Cheese, it's a fresh twist on the classic mac & cheese, plus it's an excellent source of Calcium & Vitamin A! Have your children tried Kidfresh? Connect: Follow Kidfresh on Facebook, Twitter & Pinterest! Buy it: Pick up Kidfresh at your local grocery store in the freezer section! 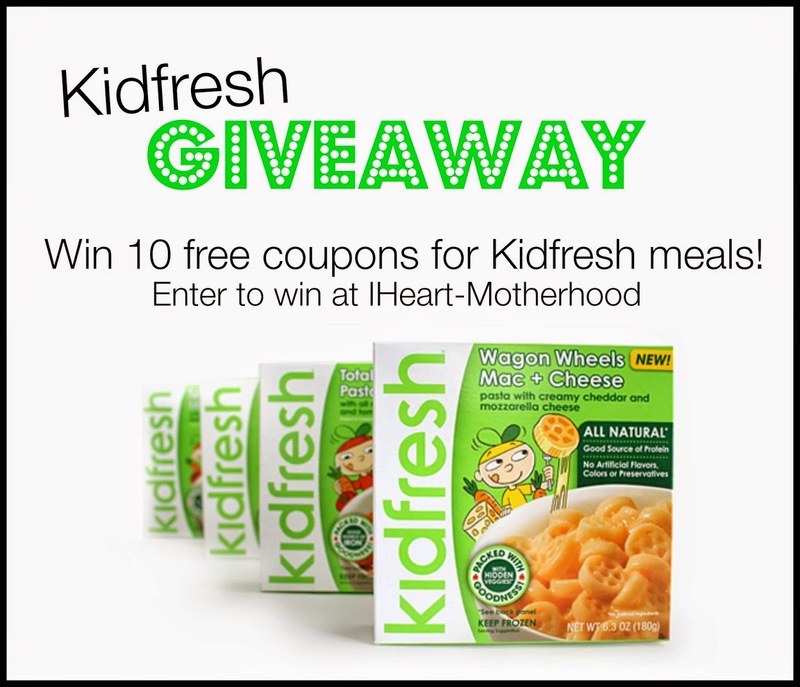 Win it: One lucky reader will win 10 coupons for free Kidfresh meals! My son would probably love them all! But especially the wagon wheel Mac and cheese! I think my kids would love the Muy Cheesy Quesadillas. We eat homemade quesadillas all the time, but I suspect these would be better. The chicken nuggets and mac and cheese would both go over big with both of my kids! My son would love the Super Duper Chicken Nuggets and the Rainbow Rice + Chicken. My niece loves pizza so she would like the Mamma Mia Cheesy Pizza. I think my kids would love the Muy Cheesy Quesadillas Single-Serve Meals. The Mamma Mia Cheesy Pizza would be terrific to try.